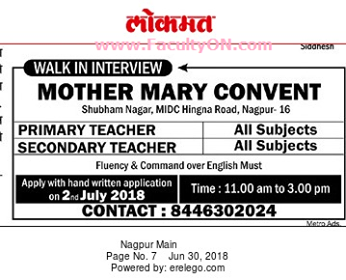 Mother Mary Convent, Nagpur has advertised in Lokmat for the recruitment of Teachers jobs vacancies. Interested and eligible job aspirants are requested to appear walk in on 2nd July 2018 . Check out further more details below. About School: The institution was established with the Motto “Excellence in education & all round development at a very affordable price. The School has shown tremendous growth, commitment to quality and a uniquely fresh approach to education and has arisen to prominence in the locality.